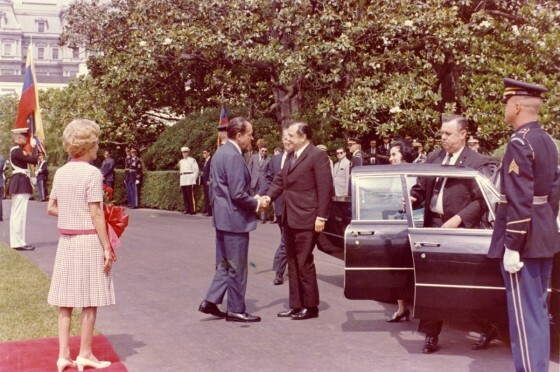 President and Mrs. Nixon greet President Rafael Caldera of Venezuela on June 2, 1970. And in welcoming you, we think of many things. We remember the fact that we have one of the longest relationships of peace and friendship with your country as with any country in the world. Just 2 days ago marked the commemoration of the 134th year of the coming into force of the treaty of peace and friendship and commerce and navigation between your country and ours. Caldera, a highly principled man, became the second Latin American chief of state to visit the United States during the Nixon administration. In fact, this was President Nixon’s third meeting with Caldera. As Vice President, he had met with him on two other occasions–at Caracas in 1958 and in Washington in 1959. -to obtain Caldera’s views on key problems facing Venezuela’s political, economic, and social situations in a climate of growing nationalism. -to reassure Caldera of the administration’s understanding of Venezuela’s need to increase its petroleum exports to the United States. -to assure Caldera of the administration’s commitment to continuing consultations on petroleum policy. -to strengthen bilateral ties with one of the few major democracies in Latin America. 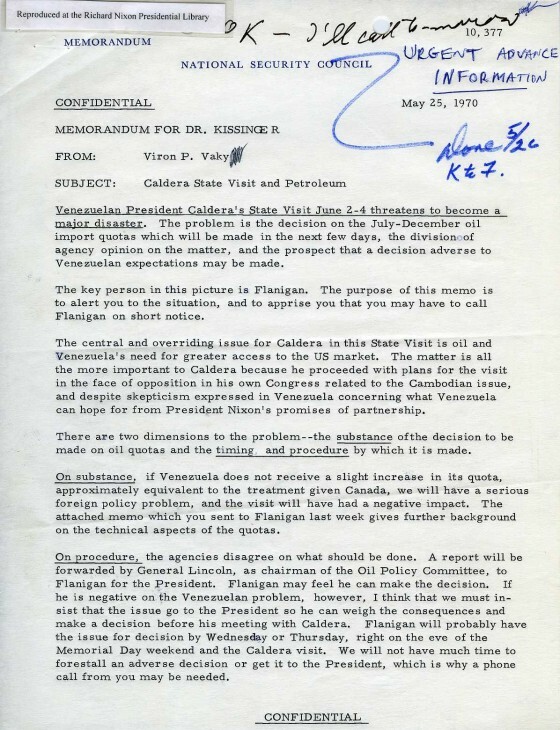 A memo from Viron P. Vaky, the State Department’s chief architect of Latin American policy, to Henry Kissinger regarding Caldera’s visit highlights the urgency of petroleum policy between the United States and Venezuela in 1970. In the memo, Vaky expresses concern over U.S. policy for petroleum imports from Venezuela. He suggests that Kissinger increase the quota for Venezuelan petroleum imports, lest President Caldera’s visit become a foreign policy disaster. A memorandum of conversation between President Nixon and President Caldera shows RN’s deep interest in Venezuelan prosperity and strength, being that it was one of the few major democracies in Latin American and a promulgator of peace.